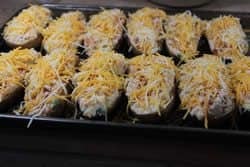 These are called smoked twice baked potatoes because you bake them in the smoker (or any heat source for that matter), cut them in half, scoop out the insides and mix it with my rub, bacon, cream cheese, jalapeños, etc., and grated cheese on top, then put it back into the potato skins and bake them even more until the cheese melts on top. 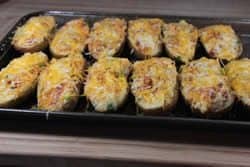 They are baked twice in the smoker thus they are called smoked twice baked potatoes. 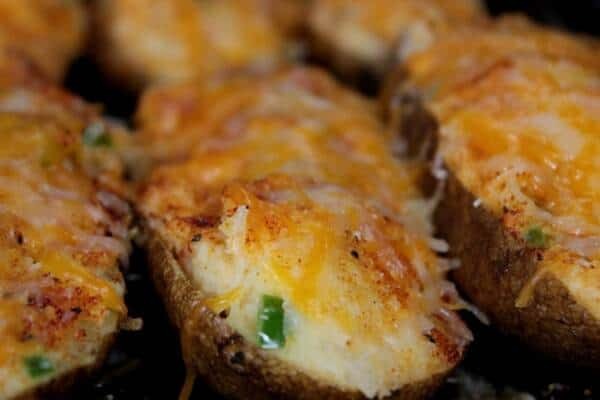 Many folks use sour cream in these but I like to use cream cheese for a richer, fuller flavor. You can mix just about anything you like into these including onions, hot sauce, parmesan, fresh ground black pepper.. the list is completely endless and only limited by your imagination. 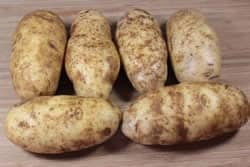 Start with nice, consistently sized potatoes. I like the ones that are oblong. Wash them under running water and dry them with a paper towel. Rub olive oil on them. Place them in a large bowl and drizzle the oil on them. Then pick each one up individually and rub the oil all over them with your hands. Sprinkle with a good dose of kosher salt and they are ready for the smoker. 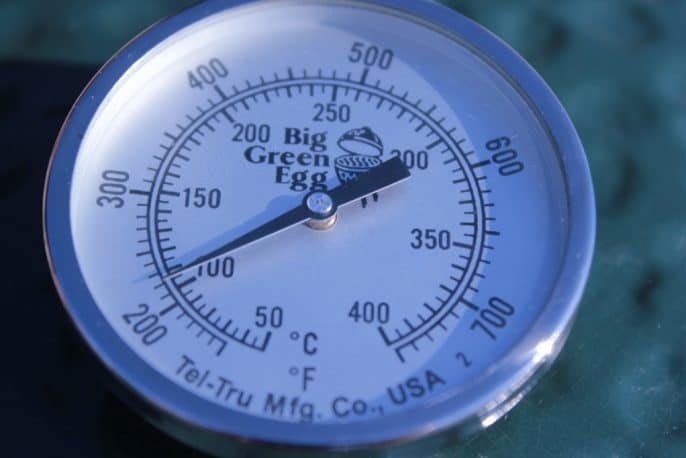 Set up your smoker for indirect cooking and if your smoker has a water pan, fill it ½ to ¾ full of water. 3 hours on the smoker grate at about 240°F should get them nice and tender. If not, let them go longer. Be careful as they are very hot and you might want to hold them with a dish towel while you slice them open. 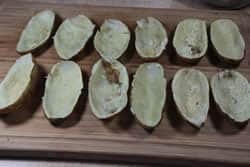 Use a large spoon to scoop out the potato from the skins. Be careful that you don't tear the skin if you can help it. 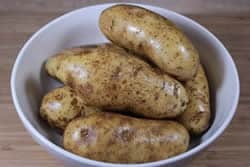 It is ok to leave a little layer of potato in there to help sturdy them up a bit. Use a potato masher or your hands, or whatever it takes to mash the potato up real good. 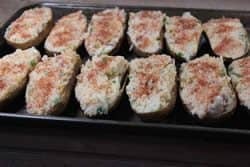 Mix the cream cheese, bacon, jalapeño, 1 TBS of rub, 1 cup of the grated cheese, whipping cream and whatever else you might like to add into the potato that you scooped out. Make the bacon crumbles while the potatoes are smoking.. 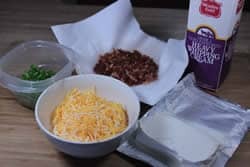 I highly recommend making your own bacon crumbles as they are so much better than the fabricated stuff in the bag (in my opinion of course) which may or may not be something you are familiar with. Simply put the bacon in the freezer for 30 minutes or so to firm it up. 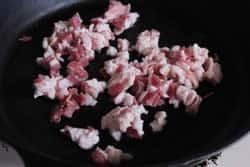 Lay the bacon out on the cutting board and cut into ¼ inch wide strips. Then, cut the strips into ¼ inch pieces. That's just how I do it.. you can also just fry the bacon and then crumble it. Whatever floats your boat! 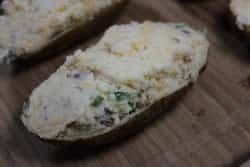 Once you have all of the ingredients mixed in with the potato and it is nice and creamy, simply stuff it back into the skins all heaped up and stuff. 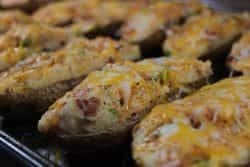 Place the stuffed potato halves onto a cookie sheet and give it a good sprinkling of my rub (purchase recipes here). Top with a good healthy portion of grated cheese. 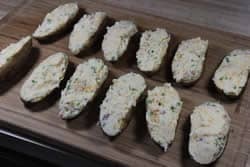 Place them back into the smoker for about 30 minutes or if you want them faster, into a preheated 325 °F oven for about 15-20 minutes or until the cheese is all nice and melty to your liking. 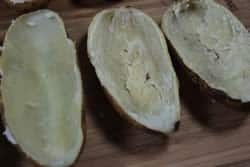 Another thing you can do after you have scooped the potato out is to deep fry the potato skin until they are golden brown just like you would french fries. Then add the potato filling or whatever you want before baking, broiling or smoking the potatoes. 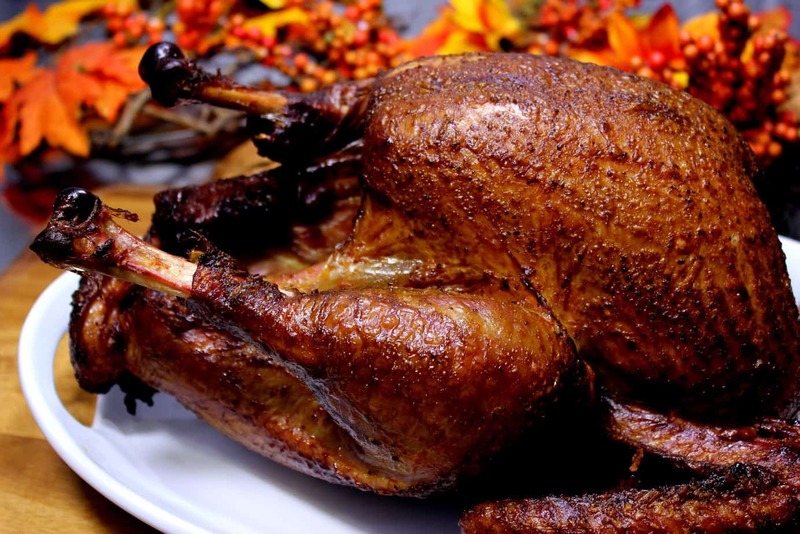 We have found that deep frying the skins really adds another layer of flavor. 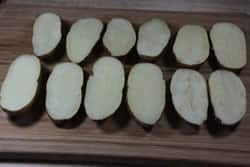 These skins can be frozen for later use and can also be used for potato skin appetizers. 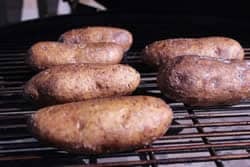 What wood do you use to smoke the twice smoked potatoes? The ultimate bacon to use is bacon that you cured yourself. 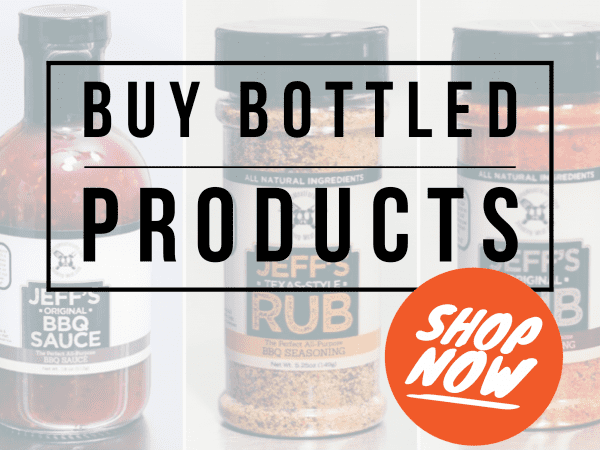 It’s easy and you can make it any flavor you like (i.e., maple, pepper, jalopeno, etc.). You can then cut the pieces any size you like. Would like to make these ahead of time. Meaning doing the first bake in the oven. After re-filling put into the smoker. Have you tried this method? 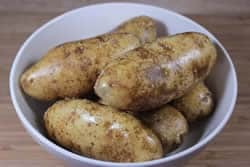 Do the potatoes taste smoked? How smoked? I’m smoking for the first time today & am so happy to have found your websight. 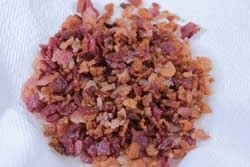 Most of the recipe is easy to follow but you were unclear on how to keep 6-8 slices of cooked bacon around long enough to crumble it and mix it into the filling. I tried making 12-16 slices but that did not work either. I admit that part is not easy.. try hiding the bacon under some healthy vegetables like broccoli, carrots, eggplant and lettuce for added security. 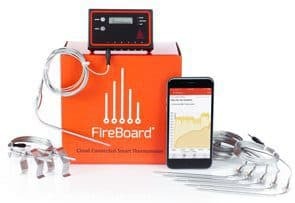 Slightly off-topic here, but have you checked out this web site? Either you wrote the article or they are clearly plagiarizing you. By the way, they left out your rub in the recipe! Rob, Thank you for letting me know. These guys have been notified a couple of times to cease and desist but they are ignoring the orders. 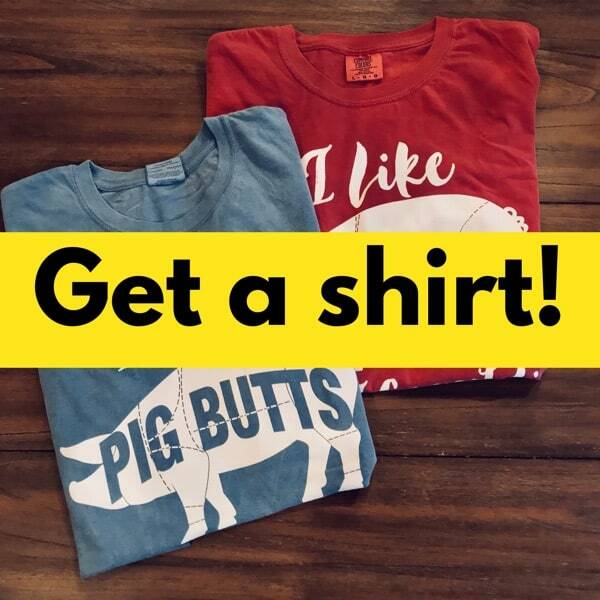 Their fB page is also using our material from smoking-meat.com to build their fan base. 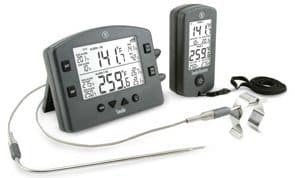 I have contacted them again this morning so we’ll see what happens =) I say if you want to build a website about smoking meat or grilling, then cook something, take pictures and then write the recipes so others can repeat it. Some just don’t have what it takes to put in the work..
A nice ‘paint’ of bbq sauce in the scooped potato bottom before heaping in the mixed contents provides also a nice ‘wow’ factor. I am a Huge fan of your Smoking Site and avid “fellow smoker”. 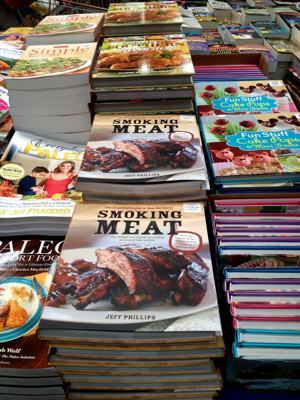 I was wondering why I have never seen you mention “Smoked Bacon” in any of your recipes. I mean REAL smoked bacon which I constantly put on my smoker (after I pepper it) along with whatever other meat I am smoking. 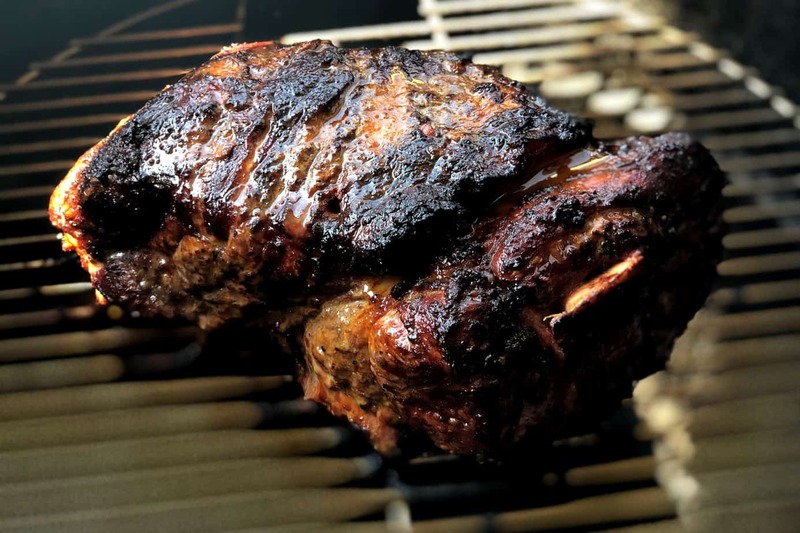 We found out just how delicious it is one day by mistake after removing it from a Pork Loin I smoked, using your recipe I might add. 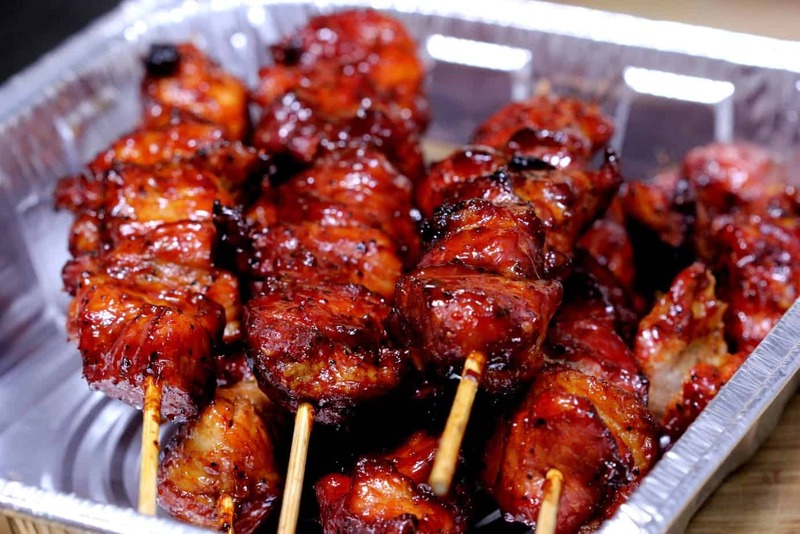 Take one or two pounds of bacon, separate onto a long platter and “pepper” it with course ground pepper. 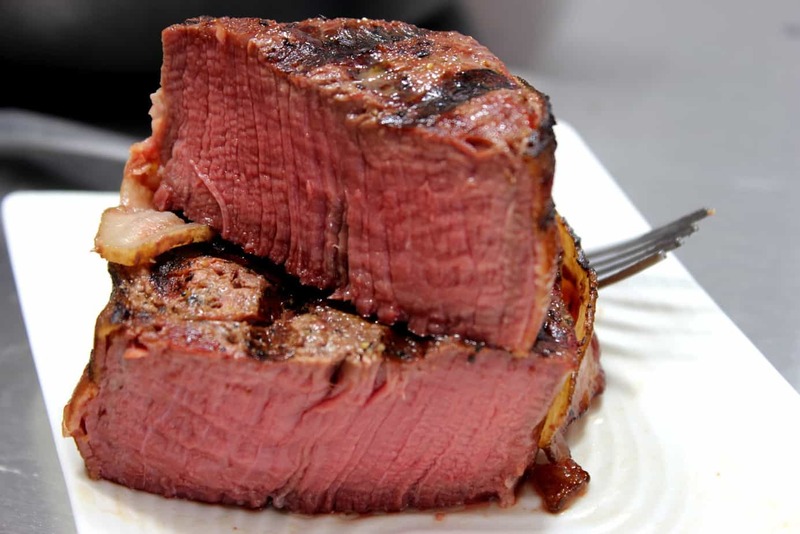 Regular cut works but “thick cut” give you more body. Put it in the smoker( I lay it over two cross pieces of the grid so it hangs and drips) along or with whatever else you are smoking and about 1.5 hrs later you have crispy, smokey, BEST BACON YOU EVER ATE! You have probably already tried this but maybe some other people haven’t. Thanks for listening and all the help your have given me with my smoking! 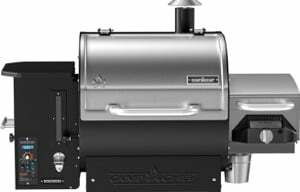 I have not tried putting bacon in my smoker, but have thought about it. And will now. But one way I have enjoyed bacon is by using Jeff’s rub on it prior to putting it in the oven. It is awesome! 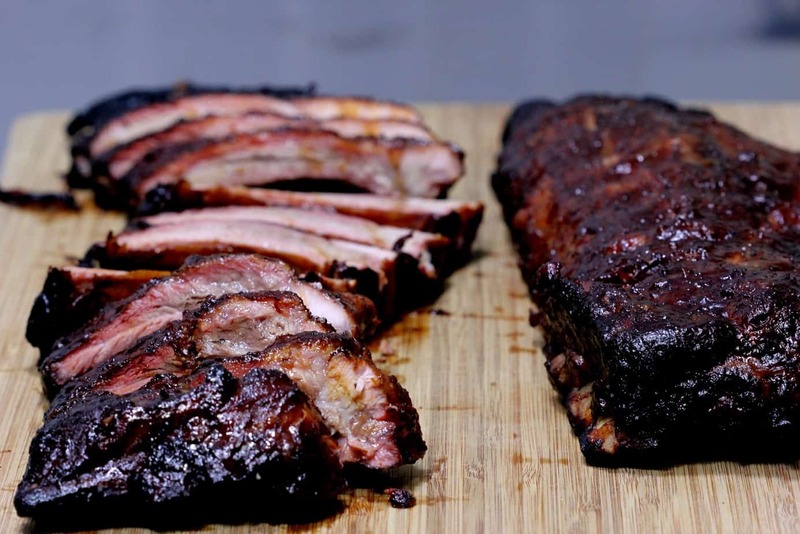 Now I am going to try it in my smoker.